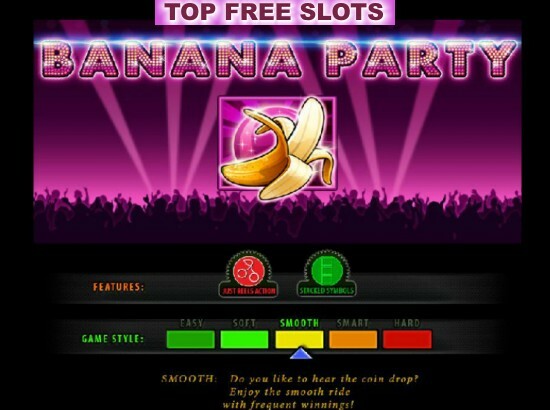 The Banana Party slot machine has been made by Casino Technology and contains 5 reels, 25 bet lines, and 3 rows of icons, which can be seen on display. It's a fruit based gamble with some innovative and unexpected extras such as disco ball and lucky 7's. This game also has one scatter, one wild joker, and a gamble option. The graphic details are extremely simple and the whole display is full with tasty fruits such as apples, lemons, plums, watermelons, cherries, and bananas. The sound effects are similar to other machines, but the background music that is the discotheque version of some popular songs takes this entertainment to the highest level. The maximum bet from 10 coins per line. The number of lines goes up to 25. The maximum wager is 250 when all paylines are activated. A value of the coin is 0.01‚¬, and it can’t be changed. Diamond Dogs - Bonus Feature 25 Line Slot from Net Entertainment. Evolution - Free Spins 25 Line Slot from Net Entertainment. Hot City - Bonus Feature 25 Line Slot from Net Entertainment. A Night Out - Bonus Feature 20 Line Slot Machine. Melon Madness - Progressive 30 Line Slot Machine. Fruit Mania - Multi Line Progressive Slot Machine.